As you explore becoming a dog owner. Westies, as West Highland White Terriers are affectionately known, are sure to pop up Here is some help with making your decision. How big a dog do you want? What dogs get along with kids and other animals? Does this breed bark a lot? Do they mind being left alone? How much time do you want to spend on daily care? Is anyone in your family allergic? Do they need lots of exercise? Congratulations on deciding the Westie might be a good match for you! A Westie is a sociable, small, always white colored dog who enjoys a daily walk. The next step is to think what it will be like to live day-to-day with your new best friend. Some of your responsibilities include food and water, vet care, bedding, exercise, and grooming. Grooming brings the big question to mind: Do Westies shed? It is an important point to consider in order to avoid an unhappy outcome. In this article, most grooming remarks refer to care provided by owners, not a professional groomer. The Westie has a soft, furry layer next to the skin and a coarse, wiry hair for a top layer. This combination provides a good insulation against cold or damp weather. And the longer stiffer outer coat prevents dirt from settling down to the skin. It catches debris for easier removal when your Westie comes in from playing. On the Westie Club of America website, it is reported that there is little shedding with a Westie. This can vary from dog to dog, but it is considered to be a low shedding dog with the shedding easily controlled with routine brushing. Another plus for this breed is the low dander(dead skin cells) count. Each person’s allergy count is different, but the Westie breed is considered an acceptable one for owners with allergies and asthma. It is not that difficult to keep your Westie’s coat shiny and healthy looking. With a daily brushing of only a few minutes, loose hairs are collected and kept off the floor and furniture. Those that escape your brush are easily picked up with a lint brush. This routine gives you and your pet time to bond and to enjoy the euphoric feelings that come with touch. You become familiar with your dog’s body and are able to recognize changes that might be health related. Matting can be a problem in the undercoat that a daily check-up can keep under control. 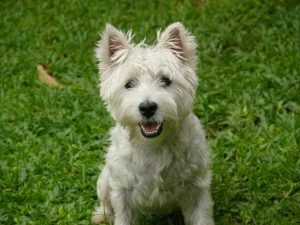 Westies thrive on gentle hands giving them attention and will love this one-on-one time. Changes of seasons may bring a bit more shedding, but nothing like that a Boston Terrier or Welsh Corgi who is known to shed constantly. Grooming also influences shedding. If you have your Westie clipped regularly you will be controlling the length of the hair as well as the condition of the undercoat. Taking your dog to a professional groomer does not mean you have to get his coat cut like a show dog. Here’s a good reference for helping you decide which cut is best for your dog’s lifestyle. Research and take time to figure out the dog best suited to your personality and lifestyle. Write down your responsibilities as a dog owner to keep your dog happy. In choosing a Westie, you acknowledge there will be some–but not much–shedding. Daily brushing keeps your Westie’s coat free from loose fur plus give quality time to your relationship. Learn what other grooming is good for your Westie and whether are not you want to find a professional groomer to keep your dog in the best shape possible. If you cannot tolerate the small amount of shedding done by Westies, then you should look at breeds classified as non-shedding dogs. Considering the question of do Westies shed, the answer is an overwhelming reply of not enough to matter. Get set to enjoy many years of happy dog ownership with your frisky, entertaining Westie!